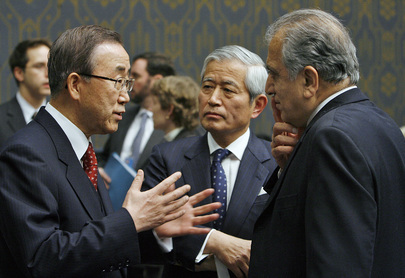 UNITED NATIONS, May 15, updated -- A perusal of Friday's appointments of UN Secretary General Ban Ki-moon is a profile in lack of accountability, lack of transparency, lack of independence and lack of will. At 11:30 is listed former chief UN lawyer Nicolas Michel, who was exposed as taking $12,000 a month in housing subsidy from the government of Switzerland while ostensibly working only for the UN, and then not including the payments on his UN public financial disclosure. Still he reappears, with UN benefits, as Ban's adviser on Equatorial Guinea and Gabon. In terms of lack of transparency, while we are glad that Ban's stealth envoy to Niger Robert Fowler was released, no one -- including on May 14 Canada's Ambassador to the UN -- had been wiling to address the statement by Al Qaeda in the Islamic Maghreb that Fowler and colleagues were released in exchange for AQIM prisoners, nor what Fowler was doing visiting a Canadian-owned mine in Niger on the day he was kidnapped. Perhaps there'll be a press availability. Update: at the May 15 noon briefing, when Inner City Press asked, Ban's Spokesperson said it's up to Fowler, and that no press availability was planned. Zalmay Khalilzad, former US Ambassador to the UN, shows up at 5:45, identified as "CEO of Khalilzad Associates." Certainly this publicly-listed face time will help his consulting business. But what's in it for the UN? Update: at the May 15 noon briefing, when Inner City Press asked, Ban's Spokesperson said it's a courtesy call. A week ago, Inner City Press asked if there was any change of Ban Ki-moon going to Sri Lanka before what the government is calling its final assault, given Ban's desire to attend the May 11 Security Council session on the Middle East hosted by Permanent Five Council member Russia, and to meet on May 15 with a minister of follow P-5 member China. The latter meeting hadn't been announced, but Inner City Press was told by well placed sources that talking points for Ban had been ordered up. And now it is confirmed: a meeting at 3:20 on May 15 with He Yafei, Vice Minister of Foreign Affairs of China, the country which most blocked Council action on the carnage in Sri Lanka. A long and telling day at the UN, and a worse -- at least in Sri Lanka -- weekend to come. Watch this site.